The Q document or Q (from the German Quelle, "source") is a postulated lost textual source for the Gospel of Matthew and the Gospel of Luke. In the nineteenth century, New Testament scholars noted that the gospels of Matthew and Luke shared much material in common, which was echoed in the Gospel of Mark. They suggested a second common source, which was termed the Q document. This hypothetical lost text—also called the Q Gospel, the Sayings Gospel Q, the Synoptic Sayings Source, the Q Manuscript, and (in the nineteenth century) The Logia—seems most likely to have comprised of a collection of Jesus' sayings. Recognizing such a Q document is one of two key elements in the "two-source hypothesis" alongside the priority of Mark. The two-source hypothesis is the most widely accepted solution to the so-called "Synoptic Problem," which concerns the literary relationships among the first three canonical gospels (the Gospels of Mark, Matthew, and Luke), known as the Synoptic Gospels. Similarity in word choices and event placement shows an interrelationship. The synoptic problem concerns how this interrelation came to pass and what the nature of this interrelationship is. According to the two-source hypothesis, Matthew and Luke both used the Gospel of Mark, independently of one another. This necessitates the existence of a hypothetical source in order to explain the double tradition material where there is agreement between Matthew and Luke that is not in Mark. This hypothetical source is named Q for convenience. The alleged existence of an ancient text, dubbed the "Q Document" is significant because it presupposes an earlier source of Jesus' teachings than we currently have in existence. If such a source was ever found, it most certainly would cast new light on the historical Jesus as well as the formation of the early Christian community. Of the four canonical gospels included in the New Testament, Matthew, Mark, and Luke—due to common narratives and viewpoints—are called the Synoptic Gospels (from Greek synoptic, meaning "seeing with the same eyes"). Their similarities exceed mere congruency in perspective, and are not easily attributed to coincidence. The narrative is retold in a common sequence, and nearly identical phrases appear in all of the works. It has been long proposed by serious reviewers that the books were based on a common published source or sources, given the improbability of three eyewitnesses producing verbatim accounts of their experiences. The recognition of this synoptic problem, and attempts to resolve it, date to antiquity. The fifth-century bishop Augustine of Hippo posited that Matthew was written first, then Mark was written using Matthew as a source, and finally Luke was written using Matthew and Mark as sources. This early and influential explanation is no longer supported by modern scholars. One of the first steps towards the solution was to note that Mark appeared earliest of the four canonical gospels. Several lines of evidence suggest this. Mark is the shortest of the gospels—suggesting that the longer gospels took Mark as a source and added additional material to it, as opposed to Mark taking longer gospels but deleting substantial chunks of material. Mark's use of diction and grammar is less sophisticated than that found in Matthew and Luke—suggesting that Matthew and Luke "cleaned up" Mark's wording (as opposed to Mark intentionally "dumbing down" more sophisticated languages). Mark regularly included Aramaic quotes (translating them into Greek), whereas Matthew and Luke did not. For these and other reasons, most scholars accept that the Gospel of Mark was written first, and the Gospels of Matthew and Luke used Mark as a source. The Gospels of Matthew and Luke were written independently, each using Mark and a second document called "Q" as a source. 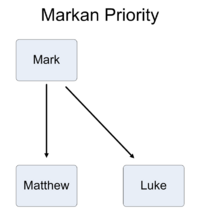 Markan priority, while explaining most of the similarities between the three synoptic gospels, is unable to completely explain the synoptic problem. The Gospels of Matthew and Luke have much material in common. Most of that material appears to have been copied from The Gospel of Mark. However, some of the material common to Matthew and Luke is not found in Mark's Gospel. The material (collectively known as the "double tradition") is often presented in both Matthew and Luke using very similar wording, and often presented in the same order. Since this material is absent from Mark, the use of Mark as source cannot explain how the same stories, using the same words, came to be found in both Matthew and Luke. 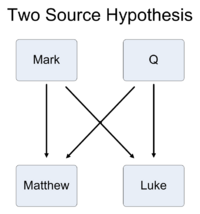 Scholars therefore suggest in addition to using Mark as as source, Matthew and Luke may have both had another second source, which they independently used in the creation of their gospels, hence the name "two-source hypothesis." This hypothetical second source is referred to as Q (from the German "Quelle" meaning "source"). Although a few scholars still question it, the two source hypothesis is currently the most widely accepted solution to the synoptic problem. Similarly, it is possible to deduce that the Q document was written in Greek. If Q had been written in some other language (for example, Aramaic), it is highly unlikely that two independent translations produced by Matthew and Luke would have the exact same wording. The Q document must have been composed prior to both the Gospels of Matthew and Luke. Some scholars even suggest Q may have predated Mark. The Q document, if it did exist, has since been lost, but scholars believe it can be partially reconstructed by examining elements common to Matthew and Luke (but absent from Mark). This reconstructed Q is notable in that it generally does not describe the events of the life of Jesus; Q does not mention Jesus' birth, his selection of the 12 disciples, his crucifixion, or the resurrection. Instead, Q appears to be a collection of Jesus' sayings and teachings. Sometimes the exactness in wording is striking, for example, Matthew 6:24 = Luke 16:13 (27 and 28 Greek words respectively); Matthew 7:7–8 = Luke 11:9-10 (24 Greek words each). Certain themes, such as the Deuteronomist view of history, are more prominent in Q than in either Matthew or Luke individually. There is a "prima facie case" that two documents both correcting Mark's language, adding birth narratives and a resurrection epilogue, and adding a large amount of sayings material are likely to know each other, rather than to have such similar scope by coincidence. Specifically, there are 347 instances (by Neirynck's count) where one or more words are added to the Markan text in both Matthew and Luke; these are called the "minor agreements" against Mark. 198 instances involve one word, 82 involve two words, 35 three, 16 four, and 16 instances involve five or more words in the extant texts of Matthew and Luke as compared to Markan passages. While supporters say that the discovery of the Gospel of Thomas supports the concept of a "sayings gospel," Mark Goodacre points out that Q has a narrative structure as reconstructed and is not simply a list of sayings. Scholars such as William Farmer maintain that Matthew was the first Gospel, Luke the second, and that Mark abbreviated Matthew and Luke (the Griesbach hypothesis). Q, part of the Two-Source Hypothesis, would not have existed if Matthean priority is true, as Luke would have acquired his triple tradition ("Markan") and double tradition ("Q") material from Matthew. Nicholas Perrin has argued that the Gospel of Thomas was based on Tatian's Gospel harmony, known as the Diatessaron, instead of the Q document. If Q ever existed, it must have disappeared very early, since no copies of it have been recovered and no definitive notices of it have been recorded in antiquity. The next person to advance the Q hypothesis was the German Schleiermacher in 1832, who interpreted an enigmatic statement by the early Christian writer Papias of Hierapolis, circa 125: "Matthew compiled the oracles (Greek: logia) of the Lord in a Hebrew manner of speech." Rather than the traditional interpretation that Papias was referring to the writing of Matthew in Hebrew, Schleiermacher believed that Papias was actually giving witness to a sayings collection that was available to the Evangelists. In 1838, another German, Christian Hermann Weisse, took Schleiermacher's suggestion of a sayings source and combined it with the idea of Markan priority to formulate what is now called the Two-Source Hypothesis, in which both Matthew and Luke used Mark and the sayings source. Heinrich Julius Holtzmann endorsed this approach in an influential treatment of the synoptic problem in 1863, and the Two-Source Hypothesis has maintained its dominance ever since. At this time, Q was usually called the Logia on account of the Papias statement, and Holtzmann gave it the symbol Lambda (Λ). Toward the end of the nineteenth century, however, doubts began to grow on the propriety of anchoring the existence of the collection of sayings in the testimony of Papias, so a neutral symbol Q (which was devised by Johannes Weiss based on the German Quelle, meaning source) was adopted to remain neutrally independent of the collection of sayings and its connection to Papias. In the first two decades of the twentieth century, more than a dozen reconstructions of Q were made. However, these reconstructions differed so much from each other that not a single verse of Matthew was present in all of them. As a result, interest in Q subsided and it was neglected for many decades. This burst of interest led to increasingly more sophisticated literary and redactional reconstructions of Q, notably the work of John S. Kloppenborg. Kloppenborg, by analyzing certain literary phenomena, argued that Q was composed in three stages. The earliest stage was a collection of wisdom sayings involving such issues as poverty and discipleship. Then this collection was expanded by including a layer of judgmental sayings directed against "this generation." The final stage included the Temptation of Jesus. However, scholars supporting the hypothesis of the three-stage historical development of Q, such as Burton L. Mack, argue that the unity of Q comes not only from its being shared by Matthew and Luke, but also because, in the layers of Q as reconstructed, the later layers build upon and presuppose the earlier ones, whereas the reverse is not the case. So evidence that Q has been revised is not evidence for disunity in Q, since the hypothesized revisions depend upon asymmetric logical connections between what are posited to be the later and earlier layers. ↑ Austin M. Farrer, "On Dispensing with Q," in D. E. Nineham (ed. ), Studies in the Gospels: Essays in Memory of R. H. Lightfoot (Oxford: Blackwell, 1955), 55-88. ↑ For example, Michael Goulder, "Is Q a Juggernaut," Journal of Biblical Literature 115 (1996), 667-681. ↑ See, for example, Mark Goodacre, The Case Against Q: Studies in Marcan Priority and the Synoptic Problem (Harrisburg, PA: Trinity Press International, 2002). ↑ Eta Linnemann, “The Lost Gospel Of Q—Fact Or Fantasy?,” Trinity Journal 17:1 (Spring 1996): 3–18. ↑ Nicholas Perrin, Thomas and Tatian: The Relationship Between the Gospel of Thomas and the Diatessaron (The Academia Biblica Society of Biblical Literature, 2001, ISBN 1589830458). ↑ Bruce Griffin: WAS JESUS A PHILOSOPHICAL CYNIC? Retrieved June 24, 2008. ↑ The Lost Gospel: The Book Q and Christian Origins (Macmillan Co. (1993, paperback 1994)). Farrer, Austin M. On Dispensing with Q. in D. E. Nineham (ed. ), Studies in the Gospels: Essays in Memory of R. H. Lightfoot. Oxford: Blackwell, 1955. Goulder, Michael. "Is Q a Juggernaut," Journal of Biblical Literature 115 (1996): 667-681. Linnemann, Eta. “The Lost Gospel Of Q—Fact Or Fantasy?,” Trinity Journal 17:1 (Spring 1996): 3–18. This page was last modified on 18 June 2015, at 15:52.